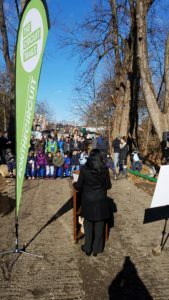 Earlier today, Philadelphia Parks & Rec hosted a groundbreaking ceremony along the Tacony Creek Trail. 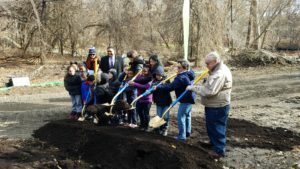 The segment, known as “Tacony Creek Trail Phase 2,” will for the first time since the construction of Roosevelt Boulevard provide a safe connection between the north and south sections of Tacony Creek Park and surrounding communities. This underpass will also connect Phase 1 of the lower trail, completed in 2013, with the upper trail, which was built in the 1970s. Christelle Charles, age 26, died on Roosevelt Boulevard as she was crossing the roadway while jogging on the Tacony Creek Trail on May 29, 2016. This connector will make it much safer to use the Trail for recreation and transportation because no one will have to cross the Boulevard again while using the trail. Local 2nd graders turn a formulaic dirt churning exercise into something fun! 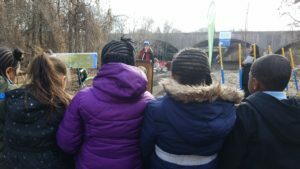 This is a major win for BCGP, Tacony/Tookany Frankford Watershed Partnership (TTF), East Coast Greenway (ECG) and city residents, and will close a major gap in The Circuit and the ECG.